BASSETT, Neb. — Isolation comes with the territory in the Sandhills of Nebraska, where grassy dunes laced with wet meadows undulate above the Ogallala Aquifer, and the thinning towns are few and far between. In the four years since he settled here, Prescott Frost has found himself set apart more than most. In a state where corn is king, he is on a quest to breed a better cow for the grass-fed beef industry — one that can thrive without chemical pesticides, antibiotics, hormones and, the clincher, grain — and to market his own brand of artisanal meat. A great-grandson of the poet Robert Frost, who tended Ayrshire cattle in Vermont, the Connecticut-born Mr. Frost has spent a lifetime taking the road less traveled by. He put down roots on 7,000 acres in what he calls the Napa Valley of ranchland, home to more than 700 species of native grasses and forbs: bluestem, buffalo, reed canary, brome — the salad bar on which grass-fed beef is raised. “If change is going to come to the cattle industry, it’s got to come from educated people from the outside,” Mr. Frost said, quoting from Allan Nation, the publisher of The Stockman Grass Farmer, considered the grazier’s bible. Change comes slowly closer to the 100th meridian, the line of longitude bisecting East from West, where the average annual rainfall drops to less than 20 inches, acreage is measured in the thousands and the big city can be a day’s drive away. Where the great cattle herds once roamed, grass finishing — an intricate and lengthy ballet involving the balance of protein and energy derived from the stalk, with the flavor rendered by earth, plants and even stress — is a nearly lost art. Recent tradition dictates that animals be fattened for the slaughterhouse as quickly and as profitably as possible, on average between 14 and 18 months of age with the help of grain. These unconventional ranchers, their cattle idling in pastures for two or more years before reaching maturity, elicit cocked eyebrows. In late April, Mr. Frost was attending the Slow Money National Gathering in Boulder, Colo., where food producers trawled for investors, when he found himself at lunch with Tom Lasater of the storied Colorado and Texas ranching family. Dining on burgers and kale salad, the men could have been mistaken for oenophiles as they debated the nuances of dry aging and terroir, or how various grasses and soil conditions affect the taste of meat. The next week, Mr. Lasater, 42, who in 2009 settled in Denver to run his family’s beef-marketing business, paid Mr. Frost a visit to discuss a possible collaboration. The connection was easy to understand. Each had been educated at Eastern boarding schools (Mr. Frost at the Putney School in Vermont; Mr. Lasater at the Phillips Exeter Academy in New Hampshire), had lived abroad (Mr. Frost in Paris and Rome; Mr. Lasater in China and Hong Kong) and had spent time in California (Mr. Frost as a stockbroker and decorative painter in Los Angeles; Mr. Lasater as an Internet entrepreneur in Silicon Valley). And though Mr. Frost took up farming in 2003 after inheriting land in Illinois while Mr. Lasater grew up in the saddle, each was focused on addressing the distribution imbalance between the heartland and the coasts, and on increasing name recognition of their brands. After beef samples sent to food writers received enthusiastic reviews, Mr. Frost created a monthly Internet club, at PrescottFrost.com, that offers organic, grass-fed ground beef and hot dogs, with steaks as a bonus for subscribers. All the meat, his own and that of other producers, relies on the genetics masterminded by his partner, Rick Calvo, who fine-tunes their ranch’s two herds: Mr. Frost’s Murray Greys and Mr. Calvo’s Red Angus. In the mid-1990s, Mr. Lasater’s father, Dale Lasater, whose holistic management techniques have been chronicled in National Geographic and the documentary “Food, Inc.,” decided to market the Beefmaster, his family’s breed. Lasater Grasslands Beef sells about 75 percent of its product through retailers like Whole Foods and Natural Grocers, with the remaining 25 percent online. 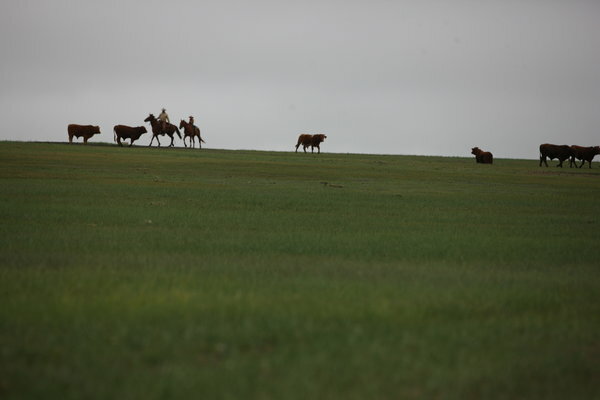 A month ago, the Lasater Ranch in Matheson — some 30,000 acres of shortgrass prairie 70 miles southeast of Denver that runs along the cottonwood-lined Big Sandy Creek, now dry — received its first rain in more than a year. Recently, Mr. Frost was recuperating after a harried drive back to Nebraska from New York and Connecticut, where he, too, had tried to drum up investors. This entry was posted in Uncategorized and tagged Beef Cattle, Feed by admin. Bookmark the permalink.